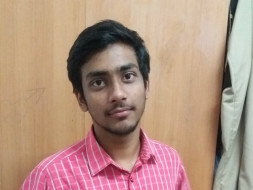 I am pursuing my B.Tech in computer Science at Quantum School of Technology, Roorkee (website). Currently I am in the second semester of my course. My course is of 4 years, consisting 8 semesters. The total fee of my course is INR6.5 lacs, out of which my family was able to pay only INR 90,305. As my father is a security guard, he doesn't earn much and he also has to look after my younger brothers education who is in School right now.My brother once started taking classes of Kick Boxing but he had to discontinue dispite being interested in it as my father could not afford his fee.My mother is a patient of a disease due to which she suffers severe headache many times a week, but she is not getting it treated because the money which will be spent over her treatment can be used for my and my brothers studies. My father was hardly able to pay the fee of my first semester by borrowing money from others. 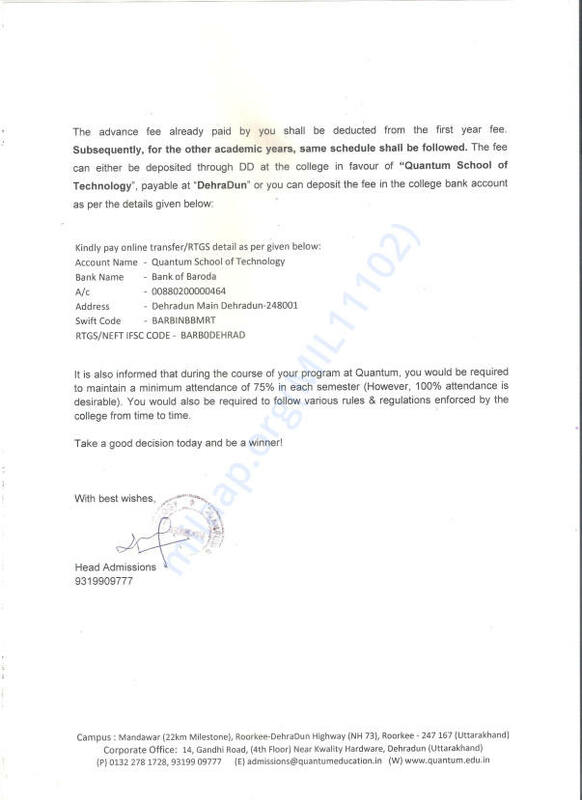 I have also applied for education loan but I am not getting any responses from the bank. If this continues, I will have to discontinue my studies. 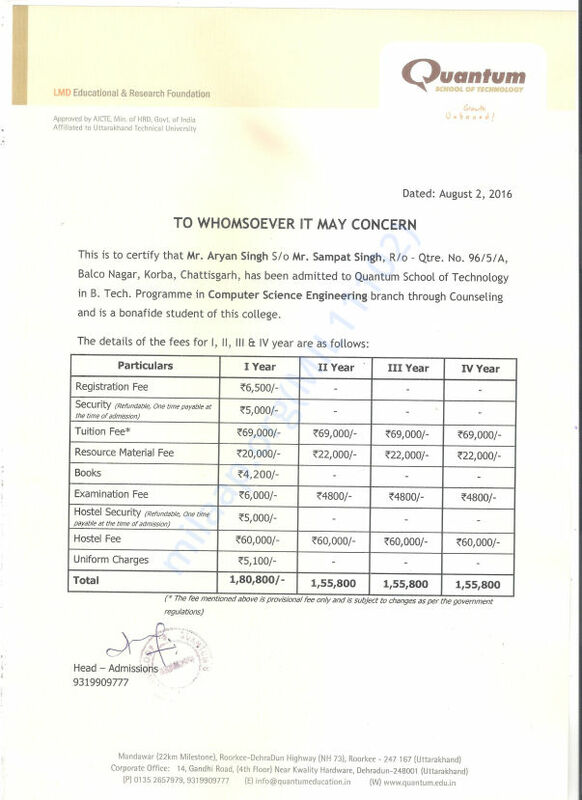 INR 69000- Tuition fee of one year. INR 60000- Hostel fee of one year. Please support me in my endeavour to complete my education. This will help change my life, and that of my family as well. This is the course fee detail provided by the institute. This is the other side of the admission letter. 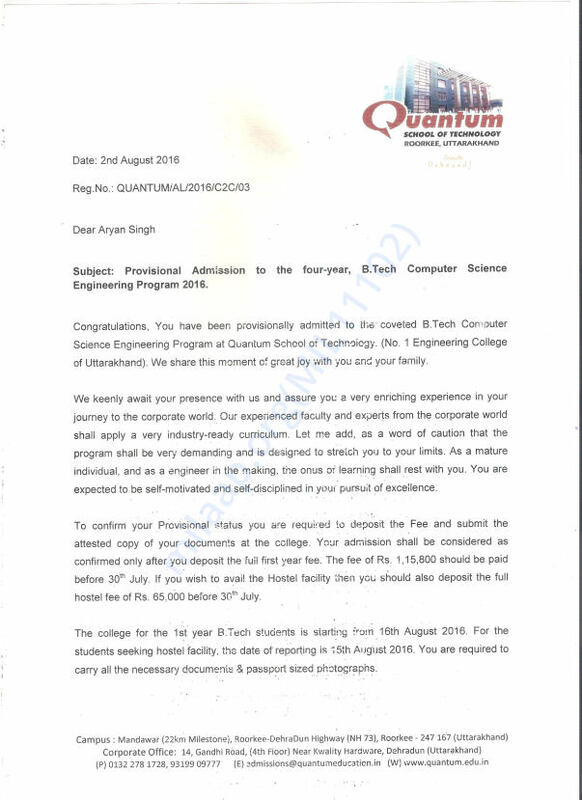 This is the admission letter provided by the college.